My family and I moved to Indonesia for a year and lived in Sentani, in the province of Papua where I taught and my wife worked in a clinic. It was a remarkable year and one of the great moments was going out to visit this village on Lake Sentani whose houses where all built on stilts standing up out of the water. 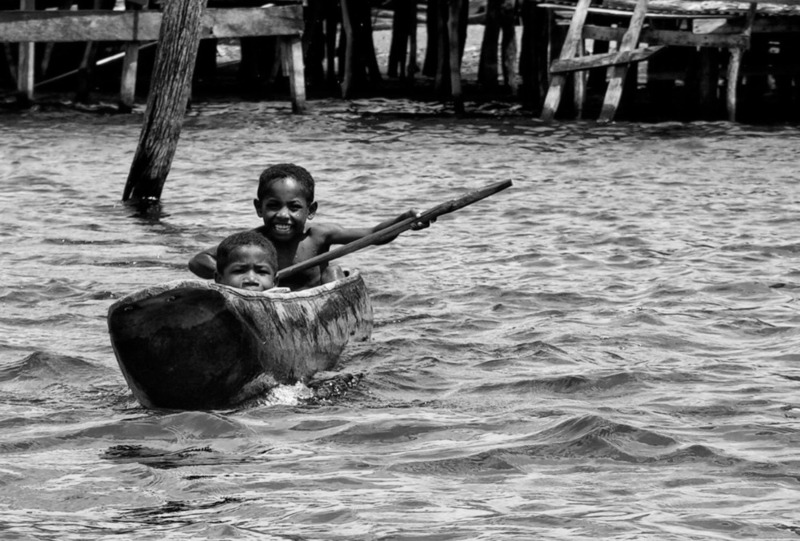 As we got close these two boys hopped in their canoe and paddled out to meet us. As they approached I saw the littler boy in front crouching to see. I got down lower in our boat and moved to the so that I could change the perspective and so that we could just see the top half of his face and still see the boy behind. I wanted to get him just peaking over the top of his canoe. I love the contrast between his look of mild apprehension and the older boy's excitement at seeing such strange people near their home.